Kieran O'Rourke and David Holmes in The Communist Threat. An actor is returning to his Derbyshire roots to perform in a thriller which he has co-written. 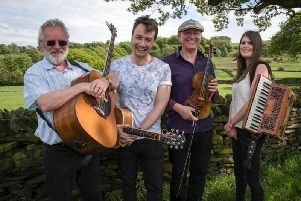 Kieran O’Rourke, who is one-third of the theatre company Rusted Dust, grew up in Hathersage where he trod the boards with the village players. He first started acting as a pupil at Hope Valley College and then at Lady Manners School. After gaining an MA in acting, Kieran set up Rusted Dust in 2011. His company will perform The Communist Threat, which Kieran has written with his colleague David Holmes. The show is set in Vienna in 1950 where two British spies are sent to kill a traitor. Cambridge graduate Kip is a celebrated war hero and an esteemed operative. Albert is a working class survivor of a POW camp. The Communist Threat runs at Underground Venues, Buxton, on July 7 at 8.30pm, July 8 at 3pm and 10.30pm and July 15 at 3pm. To book, call 01298 72190 or www.